Burton, the beaver, was lying in the soft black dirt along the banks of the river. He was enjoying the feeling of warm rain beating down on his dark, chocolate-brown fur. He yawned, opened his eyes, and looked up at the sky. The rain was coming down hard and the sky was filled with dark, gray clouds. Just then a wall of muddy water sloshed over the top of him. Burton began to gasp and cough as he was picked up by the force of the water and carried down river. After a few minutes of struggling, he was tossed onto a large boulder. He held on tightly with his short legs and sharp claws as the water cascaded around him. "What was that?" he asked out loud. He looked all around and noticed that the river had flooded, covering the reeds and tall grasses along its banks. Out of the corner of his eye, Burton spotted something struggling in the water not too far away from him. He slipped back into the river and, using his tail, swam over to see what it was. "It’s a tortoise," he noted, and dove down under the water. He came up right under it. As Burton floated up to the surface, the tortoise found himself safely on Burton’s back. "Thanks," the tortoise said, gratefully. "My name is Torquil. I nearly drowned. What on earth happened?" "Oh, the river flooded again. There must have been a lot of rain upriver. Now hold on tight. Don’t let go. We’ll swim along with the flow," Burton told the tortoise. Torquil looked around. There was nothing to see but swift-flowing, muddy water. "I think that’s a good idea. I’ll hold on tight," he agreed. Burton flipped his long tail back and forth and continued up the river. Torquil was looking all around. "What’s that up there?" he said, pointing. "It looks like a feather pillow." "I see it. Let’s go check it out," Burton said. Soon they reached the pile of feathers. "Why, it’s a bird. It’s a red-breasted robin," Torquil noted. "Get closer, Burton, and I’ll grab it by the tail feathers and pull it onto your back." Burton moved in as close as he could. Torquil reached down and hoisted the bird onto Burton’s back. It soon began to cough. "Why thank you. I was in that elm tree over there when a wall of water hit it and I fell into the river. I must have been knocked out. Thank you for rescuing me." She sat up and said, "My name is Rose. What are you two doing, swimming about in this flood?" "The river has flooded again. I found Torquil and now we’ve found you. Now hold on tight. Don’t let go. We’ll swim along with the flow," Burton told the dove. "I can see much better from up here," Rose said as she climbed onto Torquil’s shell. The three swam up the river. A few minutes passed and Rose began to whistle excitedly. "Over there! Over there! I see something red," she said, and pointed to a cattail reeds sticking out of the mud. Burton flipped his tail as fast as he could and soon they were staring at the most beautiful thing any of them had ever seen. "Well, are you going to look at me all day, or are you going to rescue me?" the insect said with sarcasm. Burton moved in closer. "Jump on top of my back," he told her. She let go of the cattail and jumped right onto Burton’s scaly back. She looked up at the red feathers on Rose’s chest. "Those are pretty red feathers," she said, looking thoughtfully. "But not as pretty as my shiny red with black polka dot wings. By the way, my name is Lindsey. I’m a ladybug beetle, the most beautiful insect in Scotland." They all looked at each other, and then at Lindsey. "You are a beautiful color, but we are each beautiful in our own way," said Burton. Lindsey brushed all the mud off her wings. She shrugged her shoulders and asked, "What happened anyway?" Burton answered, "There was a flood. All the marshes, cattails and trees are under water. I found Torquil, Rose, and now you. Why don’t you climb on top of Rose’s back and I’ll swim up river. Now hold on tight. Don’t let go. We’ll swim along with the flow." "I’ll do just that," Lindsey said. She climbed onto Torquil’s shell, and made herself comfortable on Lindsey’s soft feathers as Burton swam away. A few minutes later, all four of them noticed a branch of purple lilac flowers floating down the river towards them. "Isn’t that pretty," Rose said. They watched as it passed by. Since Lindsey was the highest, she was able to look into it as it floated by. She saw a butterfly inside the flower. It was jumping up and down, trying to get her attention. "I think the butterfly in that flower needs a helping hand," she said. Burton turned quickly and swam towards it. Rose flew down, with Lindsey still on her back, and grabbed the lilac branch in her beak. She then flew back, landing on Burton’s furry back. "Whee, what a ride!" Lindsey laughed. Rose set the flowers down. Out crawled the butterfly; its long proboscis was bent in half. "Thank you for rescuing me. I got caught in the flood when I was inside the lilacs gathering pollen." She looked at the other four animals. "My name is Bonnie. That was a terrible flood, wasn’t it?" The others all nodded in agreement. "Why don’t you climb onto Lindsey’s back. Now hold on tight. Don’t let go. We’ll swim along with the flow," Burton warned. He looked up at the sky. The sun was beginning to set. "I’ll swim around and find a place where we can rest for the night." He swished his long tail back and forth as the five swam down the river. Bonnie climbed onto Torquil’s shell, stepped on Rose’s soft red feathers, then pulled herself onto Lindsey’s shiny red and black polka dotted back. "I’d better hold on tight," she said. After searching for a while, Burton found a small patch of dirt to lie on. Soon all of them were asleep. That night, the floodwaters began to ebb, and by morning the river was back to its normal level. When the group woke up, they were surprised to see the tall grasses blowing gently in the morning breeze. The tree trunks were a little muddy, but as strong as ever. The cattail reeds were swaying back and forth as the river water passed through them. "It’s over!" Bonnie called out. "I can go back to gathering pollen!" She thanked the others for helping her and fluttered off towards the lilac bush. "Well, I guess it is time for me to say goodbye too. Thanks for everything," Lindsey called out. She wiggled her antenna and shook off her red and black polka dotted wings. "I’m off," she said and then flew away. Rose, the red-breasted robin, spread her wings. She flapped them up and down a few times to make sure they worked. "Thanks again, Torquil and Burton. I’m off too," she called out as she flew off towards the sunrise. That left only the two of them. "I suppose you are leaving too!" Burton asked, looking up at the tortoise. Torquil thought about it for a few moments. "If you don’t mind, Burton, I quite like it up here on your back. The view is great and I feel very safe. Besides that, I’m a tortoise and move rather slowly. You are a beaver and move much faster. May I stay? I can help you build a lodge or two from branches and sticks." Burton smiled a huge beaver smile. "Why sure you can. Hold on tight. Don’t let go. We’ll swim along with the flow." 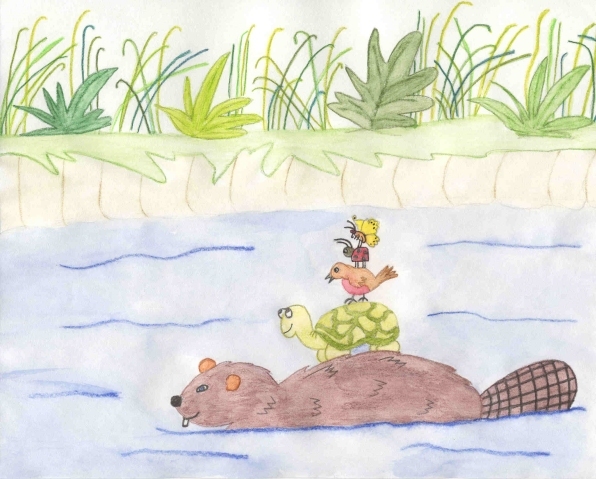 The beaver, with the tortoise on his back, swam off as the sun began to shine brightly on the calm river water.